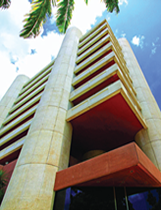 The Central Bank has been the sole issuer of Barbados’ currency since 1973. The Bank determines the denominations as well as design and security features of local banknotes and coins and is responsible for public education and counterfeit deterrence programmes. In addition to circulation banknotes and coins, the Central Bank also has a souvenir coin programme through which it sells limited edition commemorative coins and other souvenir items. Barbadian banknotes are issued in six denominations: $2, $5, $10, $20, $50 and $100. These banknotes, while all the same size, vary in colour and imagery based on denominations. Security features also vary based on the value of the banknote. Barbadian circulation coins are issued in four denominations: 5 cent, 10 cent, 25 cent and 1 dollar. While the Coat of Arms of Barbados is featured on the reverse of all coins, each denomination also features a unique image on the obverse. The size of the coin also varies by denomination. The Central Bank of Barbados periodically commissions the minting of limited edition coins and coin sets to be sold to local and international coin collectors. These coins are most often issued to commemorate major events and milestones in Barbados or the world at large.